Smiling is not merely a type of muscle movement that shows the emotion of a person. It is also essential in making positive and lasting impressions. However, there are those who would rather refrain from smiling altogether to avoid being embarrassed. The culprits? Misalignments and malocclusions! Although there is an available way to correct this problem for many years now, many people find the method to be impractical. They think that having a mouthful of metal brackets and wires is even worse than having poorly positioned teeth. Fortunately, as dental technology continue to evolve, so as the procedures and treatments available. At Plantation Dental Care, we offer a teeth straightening method that eliminates the hassles associated with braces by using clear thermoplastic materials – Invisalign! 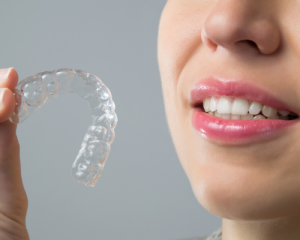 Invisalign is a brand of clear aligner that straightens the teeth without brackets and wires. Instead, it uses plastic trays that are molded based on the patient’s teeth to offer a discreet and comfortable, yet effective orthodontic treatment. The orthodontic appliance is virtually invisible! Patients both old and young will find the method more pleasant since they can undergo the orthodontic treatment without feeling self-conscious. Eating and cleaning are easier with Invisalign. Patients are required to remove the aligners when eating. Although they are designed to be durable, it is only to support the movement of the teeth and not for chewing. To not delay the treatment, patients should keep the aligner in great shape. Fortunately, patients can eat the foods they want without worrying for any debris that is hard to remove when stuck on the appliance. Cleaning both the teeth and the oral device would not be a hassle since hygiene practices can be retained. Unlike the traditional orthodontic approach, patients who opted for Invisalign are not required to see the dentist often. The aligner trays are provided by set and sequence beforehand along with the schedule on when to switch out. Visits are still necessary, but this is only for the dentist to keep track of the progress and to provide additional trays when necessary. Compared to metal braces, Invisalign can offer fast results as long as patients wear the aligners as advised (20 to 22 hours a day). The schedule and order when replacing each aligner should also be followed to get the best results. Our patients at Plantation Dental Care can expect Invisalign to be a more comfortable treatment since the materials used deliver constant and much-controlled force to move the teeth. Discomfort is common to any orthodontic option, but Invisalign which uses modern techniques reduced it significantly for a pleasant orthodontic experience. What are you waiting for? Let us help you get started! The road to straighter and healthier teeth begins with an initial consultation. If you’re looking for Invisalign in Plantation, FL, contact us at Plantation Dental Care and schedule an appointment!